As marketers, we are so busy creating content, generating leads, or putting out the proverbial fire, that we don’t take time to look around and get a sense of the market. This article, and others this week, illustrate how you can collect and use data to escape the echo chamber of marketing. Anyone who has been in marketing long can attest to the echo chamber we often work in. We are so busy creating content, generating leads, or putting out the proverbial fire, that we often don’t take time to look around and get an accurate sense of the market. That common predicament is the reason for this week’s series of articles focused on helping marketers become more empowered to bust out of the echo chamber, finding and leveraging data that speaks to the true story of what they are currently doing and what they should be doing. This article, and those to follow, present data on some interesting points that help make up a set of best practices for marketers. Perhaps more importantly though, these articles also reveal techniques that we’ve used to find these unique insights: methods around collecting data, tips on tools we’ve used, and know-how encompassing data analysis. The first tip we’d like to impart, as you think about collecting and analyzing your own original data to build your own set of marketing best practices, is this: leverage the hunger of academics! As I am a current marketing Ph.D. hopeful, I’ve seen the inner workings of one of the leading research universities in the world. Pennsylvania State University, where I research and study, has thousands of graduate students all looking to make a name for themselves in the world of research. Each of these graduate students is required to take numerous courses that focus on survey design and deep data analysis. To get jobs, these students need access to data and research projects from industry professionals such as yourself. Additionally, each of these students is working with world-renowned professors that are also hungry to complete new research projects that will help feed their prestigious persona and earn them a higher position on the ivory tower. In keeping with this advice, we have worked with world-renowned marketing professors at Pennsylvania State University and the University of Virginia on this project. These bright minds in academia have contributed over a dozen hours to ensure the questions being asked, the survey instrument, and the process for analyzing the data in this project are rigorous. How much has ClearVoice needed to pay for this expert help? Nothing. So, next time you want to do cutting-edge research, I encourage you to look up the directory of researchers at your local university and let them know what you’re working on. Chances are they’ll want to be a part of it and will give you substantial resources towards creating your own marketing best practices. The customer journey map, as we discuss in more detail in the next section, is an important element of any marketing campaign. With this map, you’ll have a better understanding of how your customer is currently engaging with you, and in what ways you should sculpt that engagement path so you have more happy customers. We chose to use Qualtrics, perhaps the most powerful (and expensive) survey solutions out there. Because we have access to academic researchers who already had Qualtrics accounts at their university, the cost to ClearVoice was zero — another reason you should reach out to academic researchers for your next big data collection project. While Qualtrics is a powerful research tool, there are several others that are much more affordable and can also yield good results, if used correctly. Be sure to read this earlier ClearVoice post on the best affordable data collection survey tools. Finding people to take your survey is generally the most difficult aspect. If you run the survey among just your connections on LinkedIn, or among individuals you directly work with, you’re not going to get a non-biased collection of responses. For this survey, we received the vast majority of our responses by posting solicitations in global communities where we are already active. These communities can exist on Facebook, LinkedIn, or within martech communities (e.g., Marketo’s User Community). Just make sure you ask permission of a community administrator before posting as they sometimes see these posts as promotional. If you clearly explain that you’re working with a research institution to collect data in a non-promotional way, they’ll usually allow you to post your solicitation. Why study the customer journey? For this first article in this Data Week series, we’ve chosen to focus on helping you build your own marketing best practices on customer journey management. Customer journey management is the art and science of measuring how your customers are currently engaging with your company between the buy side and then, perhaps most importantly, once they are customers. Customer journey management then helps you formulate a plan for how you can improve processes to better engage your prospects and customers, increasing sales, repeat business, and word of mouth referrals. The traditional buyer journey, popularized by HubSpot and their Inbound Academy, specifies that a prospect works through three phases: awareness, consideration, and decision. These buyer journey maps, the first half of a full-on customer journey map (which helps marketers identify which content and marketing touch types should occur at each stage), have evolved and become ever more complex in the last few years. I’ve been watching this transformation closely and have collected dozens of different versions of buyer and customer journey maps. Three versions of these maps, which speak to different aspects of a customer journey, are included below. This map, popularized by HubSpot, looks more at the buyer journey. This is one of the more popular maps you’ll see on the internet due to its simplicity and the way it suggests different content types for each stage of the journey. Of the 76 survey respondents, 33% of respondents said this map is most closely aligned with the map in use at their organization. This map covers the full customer journey, with post-purchase stages. Instead of covering content types, as the HubSpot version above, this one recommends the appropriate marketing channels at each stage of the journey. In our survey, 19% of respondents said this map is most closely aligned with the map in use at their organization. 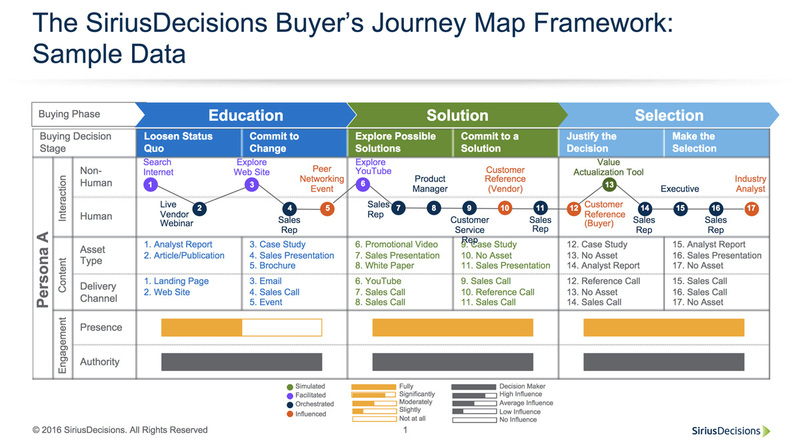 While this map only covers the buyer’s journey, SiriusDecisions has done a fantastic job of showing how more sophisticated marketing organizations can layout multiple aspects of the journey into one relatively simple graphic. While a robust map, it was one that only 12% of respondents indicated was similar to that in use at their firm. One thing I’ve noticed, as I’ve read dozens of articles pontificating on the subject of customer journey management, is that there is little statistical backing behind the theories being used by firms to build their own strategies. Yes, some companies have built “closed loop reporting” mechanisms to identify their own customer journey tracks. But even for these few companies that have done this well, there still appears to be some significant doubt, in the minds of the marketers, if they’re placing their content in the right stages of the journey. The data we collected on customer journey maps, presented in the next section, illustrate the importance of rethinking current customer journey management strategies. While 70% of respondents indicated their companies are active in content marketing, only 48% have a customer journey map to guide them on their way. Of those who have a customer journey map in place, only 43% have validated the accuracy of their map through comparisons to actual marketing and sales reports from the customer resource management software. 1. Does your company understand customer needs and requirements? 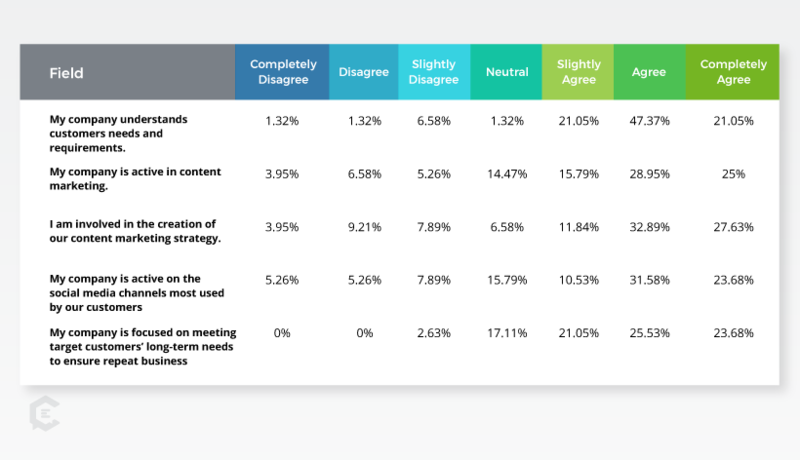 Most marketers feel like their firm does a good job of understanding the needs and requirements of customers, with 89% of respondents indicating some form of affirmation that their firm does understand customer needs. 2. Is your company active in content marketing? In an effort to make sure this survey was getting in front of people that are actively engaged in content marketing, and thus are more likely to understand their firms use of a customer journey map, we solicited surveys from social communities (such as ClearVoice followers) where we knew content marketers were spending time. Did it pay off? Indeed it did, as 70% of respondents indicated that their firm was active in content marketing, and 72% of respondents indicated they are personally involved in the creation of their firm’s content marketing strategy. 3. Is your company active on the social media channels most used by your customers? While most (65%) indicated that their company is active in these locations, it is interesting to see that the percentage is smaller than the 70% that indicated they are active in content marketing. This finding indicates that there are some firms out there who are actively creating marketing content but then not sharing it on social media. 4. Is your company focused on meeting customers’ long-term needs to ensure repeat business? Interestingly, of the firm-related questions we asked, this one had the smallest percentage of respondents that disagreed, to some level: Only 3% of respondents indicated their firm was not focused on the long-term needs of customers. Just as we’ve started to see democratization in much of the business world, it appears that the respondents to this survey work for forward-thinking firms that have the right priority. I would love to see responses to this same survey question a decade ago, before the popularity of democratization, to see how much higher this number would be. 5. How well is your company doing at growing sales revenue and acquiring customers? As a check of the responses, to determine if respondents were thoughtfully completing the survey, we asked two separate questions to gauge 1) how well their firm is doing at growing sales revenue, and 2) how well their firm is doing at acquiring new customers. As we hoped, a very similar proportion of respondents indicated similar measurements on these two aspects, with 64% saying their firm does slightly better, better or significantly better at growing sales revenue, with a similar percentage (60%) affirming the same for acquiring new customers. 6. How is your company doing at retaining and satisfying current customers? Due to the fact that 70% of firms are actively participating in content marketing, we expected to see a high percentage of these more forward-thinking firms also doing well at retaining existing customers and having high customer satisfaction rates. However, we didn’t expect respondents to say their firms do this well at these two aspects: 71% feel their company is doing better than average at retaining existing customers and 79% claim their firm does better than average at customer satisfaction! 7. Are your company’s marketing and sales software synced together? Does the high performance, in growing sales, acquiring new customers, and delighting existing customers happen because of greater marketing sophistication? A common measure of how sophisticated a firm’s marketing processes are is the extent to which a firm’s marketing and sales software are synced to talk to each other. This survey found that only 57% of respondents said their systems were synced, bringing up an additional question, for future researchers to evaluate, as to whether or not marketing technology sophistication of a firm results in higher revenue and customer satisfaction performance. 8. Does your company have a customer journey map? 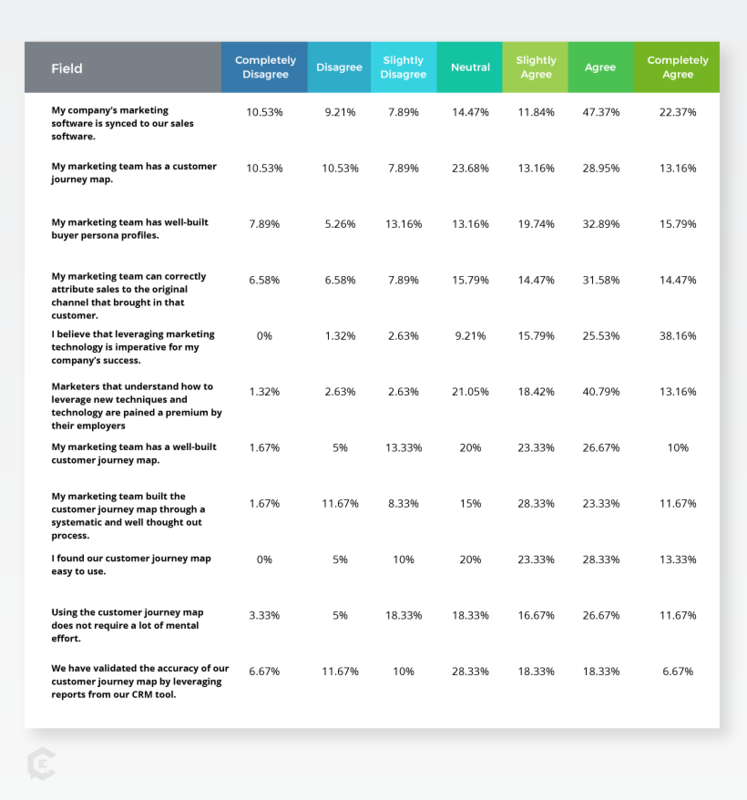 We were pleased to see that, of all respondents, almost half said that their company has some form of buyer or customer journey map in place. However, of the 48% that said they had a map in place, 40% indicated they did not agree that their company’s customer journey map was well built. 9. Does your marketing team have well-built buyer personas? We were not surprised to see that 60% of respondents agree that their marketing team has well-built buyer personas, as the use of buyer personas seems to be more commonplace than customer journey maps. Additional research from Aberdeen shows that firms utilizing both buyer personas and customer journey maps experience a 70% increase in conversion, versus companies not using both. 10. Can your marketing team correctly attribute sales to the original channel that brought in that customer? Not surprisingly, 37% of respondents did not feel like their marketing team could correctly attribute sales to the first touch channel. This discrepancy did not come as a surprise to us as attribution is often one of the more difficult aspects in measuring the appropriateness of your customer journey management strategies, especially for the kinds of businesses that have a greater need for customer journey management: firms with longer and more complex sales cycles. 11. Is marketing technology important to the success of your firm? Perhaps one of the least polarizing questions, a mere 4% of respondents indicated some level of disagreement that marketing technology was important to the success of their firm. Likewise, only 6% of respondents disagreed that being paid a premium by their employer was at least partially dependent on that marketer’s ability to leverage new marketing techniques and technology. 12. Did you work with your sales team to build out your customer journey map? 13. Does using your customer journey map improve your performance on the job? Of the eight questions we asked that drilled into questions specifically about the benefits of the customer journey map, this question was one of two with the highest affirmation. Only 17% felt like using a customer journey map did not help improve their job performance. 14. Is your customer journey map easy to use? One area of improvement that we’ve identified is that marketers should make their journey maps easier to use. 15% of respondents indicated their customer journey maps were not easy to use, and an even greater percentage (27%) indicated that using their customer journey map requires a lot of mental effort. 15. Have you validated the accuracy of your customer journey map by leveraging reports from your CRM tool? Another area of improvement, for marketers to gain full advantage of a well-built customer journey map, is to validate the accuracy of their customer journey map by comparing stages in the funnel to those reported by their customer resource management (CRM) tool. The purpose of sharing all this data on customer journey management is not to overwhelm you. In fact, we hope it helps you see that you’re not alone as you struggle to better understand your prospects and customers. No matter the stage of development your firm is currently in, having any sort of customer journey map, if even somewhat well built, will help you to do better marketing. It will help you shift your thinking to better align your marketing efforts with what your prospects and customers need. If you’re feeling overwhelmed by the prospect of building a customer journey map, perhaps this final finding from our research will help you feel more confident: 62% of respondents felt like they were not customer journey map experts, and only 5% “completely agreed” that they were experts in this field. You are not alone if you’re feeling overwhelmed. Choose today to start building your own processes of customer journey management.